I had some fresh Vellarikka (Sambar Cucumber) and Achinga Payaru (Yardlong Beans) with me. Thanks to two wonderful ladies who shared their home-grown vegetables with me! I made a Mezhkkupuratti with tender Achinga. I separated the beans from the more fibrous Yardlong Beans and discarded the pods. I didn’t know what to do with it and decided to try something similar to Mathanga Vanpayaru Errisery. 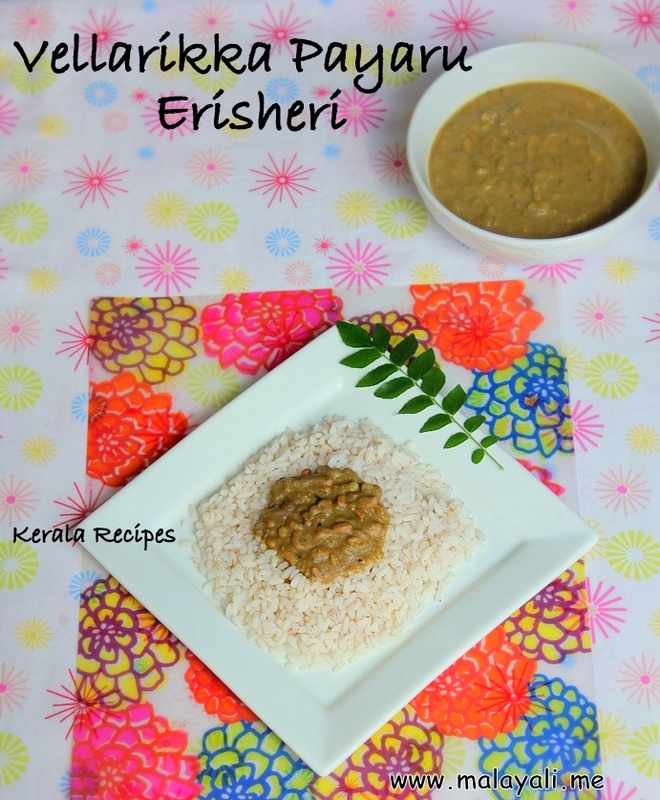 I also used Lentils (Parippu) while making this Erishery. Vellarikka (Melon Cucumber) is known as Dosakai in some parts of India and belongs to the Gourd family. It is usually greenish-yellow in color and comes in all shapes and sizes. It is often added to Sambar. You can also make Pickles and Pachadis with it. Once cooked, Vellarikka is very similar to Pumpkin. It becomes mushy with a thick consistency. 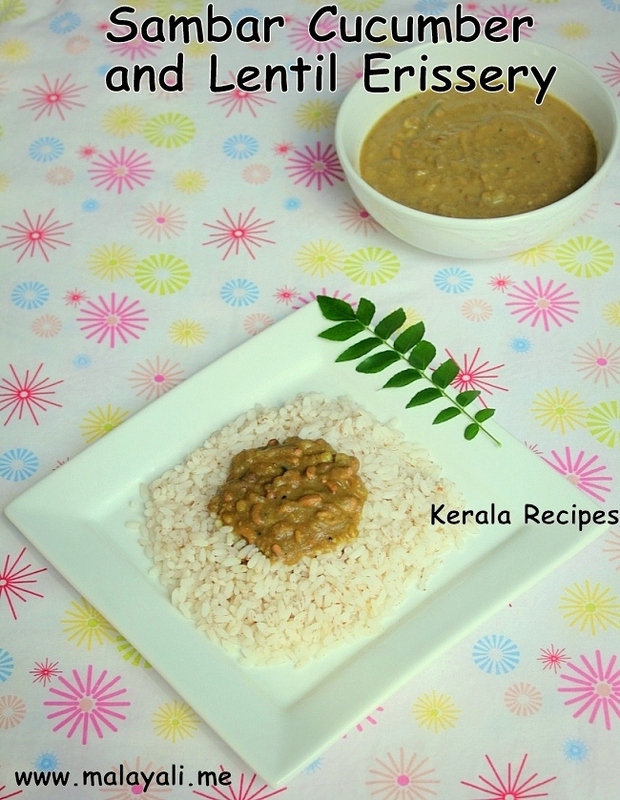 So if you have Vellarikka with you, try this Velarikka Payaru and Parippu Erisheri for Onam. Peel the cucumber and cut it into halves along the centre. Scoop out the seeds and dice it into medium chunks. Remove the beans from the mature and fibrous yardlong beans and discard the pods. Wash and drain the split green peas. Pressure cook the cucumber, payaru and split green peas in 2 cups of water along with 2 garlic cloves, 1/4 tsp turmeric powder and salt to taste for 1 whistle on medium-high heat. Meanwhile, in another pan, roast the grated coconut on medium heat, stirring frequently. Once the coconut begins to brown, reduce heat, add the garlic and red chilly powder. Roast for a few more minutes. Remove from heat and allow it to cool. Grind everything to a smooth paste along with 1/4 tsp cumin, 1/4 tsp black pepper powder and little water. Once the pressure has subsided, open the cooker and add the roasted coconut paste to the pan. If the erisheri appears very thick, add a little water. Simmer for five-seven minutes, stirring occasionally. Add more salt if needed. Heat 1 tbsp coconut oil in a another pan and splutter mustard seeds. Throw in the shallots, red chillies and curry leaves. Saute until the shallots turn golden brown. Pour this seasoning over the Erishery. Mix and remove from heat. You can use any lentil/dal like Cherupayaru Parippu (Split Mung beans) or Tuvara Parippu (Toor Dal) instead of Split Green Peas. If you don’t have Achinga Payaru, you can leave it out. Vellarikka and Parippu will suffice for this Erissery.